Theresa May will update MPs on Tuesday about recent Brexit talks as she continues to seek support for her deal. She visited Dublin and Brussels last week seeking EU agreement on changes to the backstop – the “insurance” policy to avoid the return of visible Northern Ireland border checks. Last month MPs – who will debate Brexit on Thursday – voted for the PM to find alternatives to the current backstop. But the EU have said they would not renegotiate the withdrawal agreement. However, efforts to come up with a solution acceptable to both sides continue. Brexit Secretary Steve Barclay will meet with a group of MPs working on possible alternatives to the backstop later, before heading to Strasbourg to hold talks with EU negotiator Michel Barnier as the EU and UK Brexit negotiating teams discuss proposed changes to the deal. What’s behind Corbyn’s Brexit letter to May? The statement to the House of Commons on Tuesday – a day earlier than had been expected -follows an exchange of letters between Mrs May and Jeremy Corbyn. The Labour leader wrote to the PM on Wednesday with a list of five demands to secure his party’s support for her deal, including a permanent customs union. 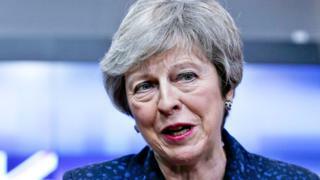 The prime minister struck a conciliatory tone in her response overnight and said she looked forward to the two parties meeting again “as soon as possible” to discuss ways forward on Brexit. But No 10 said it rejected any proposals to remain in a customs union with the EU. Some of her cabinet members also quashed the idea, with International Trade Secretary Liam Fox calling Mr Corbyn’s proposal a “dangerous delusion”. This is despite Mr Corbyn repeatedly saying there should be a general election if Mrs May cannot get a deal through Parliament. He has also faced pressure from some of his MPs to push for another public vote on Brexit. Labour MP David Lammy – who supports the “People’s Vote” campaign for a new referendum – said Mrs May’s letter “makes it clear there is no hope of her agreeing” with Mr Corbyn’s demands and said his party should campaign now for a fresh vote. The anti-Brexit Liberal Democrat’s spokesman, Tom Brake, said it was “astonishing” the two leaders were starting “serious discussions about delivering disastrous Brexit together” 900 days after the vote to leave the EU. Does the letter give political cover? It could have been a very different sort of letter. Mrs May could have just underscored her red lines: No to extending Article 50. No to another referendum. No to a customs union. Instead, it’s a much more conciliatory and consensual letter. There’s praise for Mr Corbyn in accepting the priority now should be on reaching a Brexit deal, rather than pressing for a general election. Praise too for his acknowledgement that the backstop has got to be changed. And there’s some movement on employment rights and the promise of more cash for hard pressed communities. Even on the customs union – their key dividing area – Mrs May’s language is more nuanced, even though privately her aides insist there can be no question of accepting a permanent customs union. It’s unlikely to be anywhere near enough to win over Mr Corbyn. But it may be enough for those labour MPs in leave supporting constituencies, who are looking for political cover to back or abstain on Mrs May’s deal. What has Labour asked for – and how has the PM responded? In his letter, Mr Corbyn asked for five changes to be made to the Brexit deal. The Labour leader called for a “permanent and comprehensive UK-wide customs union” with the EU to be introduced to the deal, with the same external tariff. He said it would give the UK a say on any future trade deals that the EU may strike. In her reply, Mrs May said the political declaration – the second part of her deal which is a non-legally binding statement on the future relationship between the UK and EU – “explicitly provides for the benefits of a customs union”, with no tariffs, fees, charges and restrictions. What is Labour’s customs union policy? But, she said, it also allows for the UK to strike up its own trade deals elsewhere. But, she added her reassurance that securing frictionless trade with the EU was “one of our key negotiating objectives”. Speaking in Switzerland, where Mr Fox has just signed a deal to see the country trade with the UK on the same terms it does now, the minister said the idea was “not workable”. He added: “The idea that we can have a customs union with the EU and at the same time, as an outside country, have an effect on EU trade policy, is to not understand the EU treaties. Mr Corbyn also wanted the deal to include a promise for the UK to be closely aligned with the Single Market after it leaves the EU, “underpinned by shared institutions and obligations”. Mrs May quoted the EU as saying the current deal provides for the closest relationship possible outside the Single Market. The PM also repeated the EU’s warning that completely frictionless trade is only possible if the UK stays in the Single Market. “This would mean accepting free movement, which Labour’s 2017 General Election manifesto made clear you do not support,” she added. Labour has called for the UK to stay in step with the EU on rights and protections for workers, which was included in Mr Corbyn’s letter. This could be referring to proposals that were said to have been discussed earlier this month from a group of Labour MPs in predominantly Leave-supporting constituencies, to allocate more funds to their communities for big infrastructure projects. The PM also said that while she had “always been clear that Brexit should not be at the expense of workers’ rights or environmental protections”, she did not support automatically following EU rules in these areas. “Given their importance, we believe these decisions should be taken in our Parliament by our elected representatives,” she added. But she tried to reassure Mr Corbyn that the government had made legally-binding commitments not to move back in these areas and they are prepared to consider legislating to give these commitments force in UK law. The Labour leader called for a promise to participate in EU agencies and funding programmes on the environment, education and industry regulation after Brexit. The prime minister said the government supports participation in EU programmes in a number of areas, as set out in the political declaration – which includes areas such as science and innovation, youth, culture and education, and overseas development. Mrs May also said the government wanted the closest possible relationship with EU agencies in “heavily regulated sectors”, such as medicines and aviation, “subject to us being outside the single market”. Finally, Mr Corbyn demanded agreements with the EU on security, such as access to the European Arrest Warrant database. Mrs May said the government “shares your ambition in relation to security arrangements”. But, she added, there is a challenge that as a third country outside of the EU, there are restrictions on the UK’s ability to participate in some EU tools and measures. Mrs May said: “The government does not believe it would be in the interests of either the UK or the EU and its Member States to see a reduction in joint security capabilities. Labour is yet to respond to the letter.